Here at Cooking Up Romance, I post a romance novel review with a matching recipe on Mondays and then Thursdays usually mean a brief essay on some topic tangential to my interest in romance like how to find great writers on Twitter and why romance gets so little literary credit. This week though, my brush with romance was actually a recipe rather than some profound philosophical discourse (ha!). I was testing out a recipe for chocolate ice cream with a bourbon caramel swirl and it left me with a lot more caramel than I had an immediate use for. Enter Shari Slade, Queen of Temptation. She suggested pouring the caramel in the bottom of a pan of cinnamon rolls, which as a solution to my caramel problem seemed like a super one. Do you know Shari? She just released a wildly delicious book with Amber Lin called Three Nights with a Rock Star , which is basically the romance equivalent of Bourbon Caramel Pecan Cinnamon Rolls: sweet, decadent and totally addictive. I thought it was great, but if you want a full review, you can see mine here at Goodreads. Seriously, go buy the book. 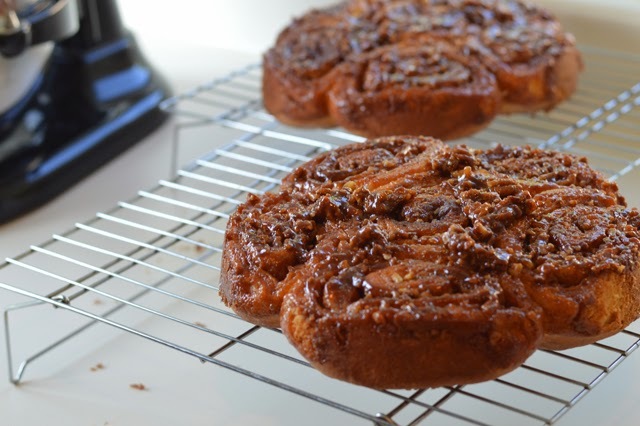 So…these cinnamon rolls. I knew they’d be good, but I really didn’t know that they’d be this good. 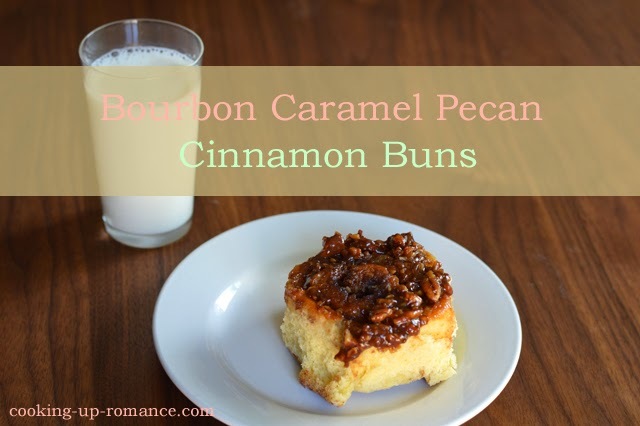 The bourbon in the caramel is subtle, acting like a secret ingredient for awesome. Seriously, I sent most of the batch to work with my husband and I got an actual marriage proposal. Delivered by my husband. By the time they were gone, people were offering to drive seven hours to snag some. So they’re pretty delicious. 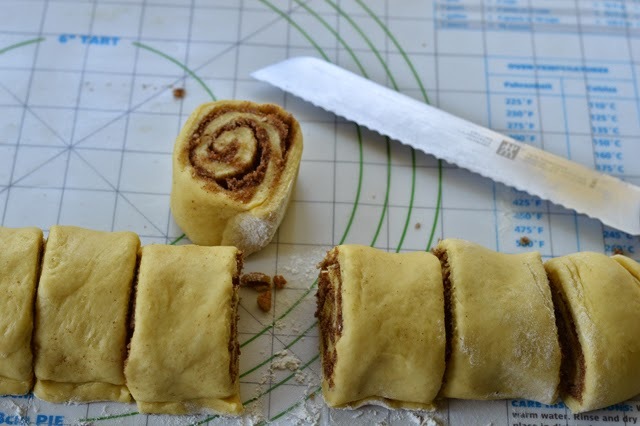 I started with this recipe for cranberry orange rolls from Smitten Kitchen for the dough. I kind of winged it when it came to quantities of brown sugar, cinnamon, pecans and caramel to use since I never intended to post the recipe. So I had to make them again in order to double-check quantities and rise times. Twenty-four cinnamon rolls in two days. Whoopee! Now that’s what I call wild. You’ll probably need a glass of milk or cup of coffee to go with these. Or, you know, you could just go with bourbon. I suspect I can guess what Shari would say about that. 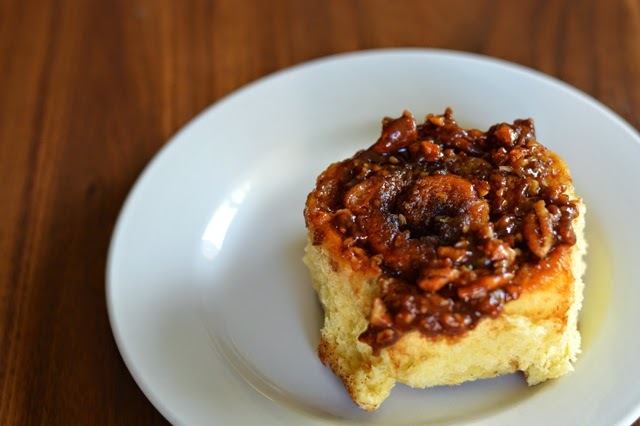 A classic cinnamon bun topped with decadent bourbon caramel sauce. In the bottom of the bowl of a stand mixer, whisk the yolks, whole egg, sugar, melted butter and buttermilk. Add 2 cups of the flour along with the yeast and salt; stir until evenly moistened. Switch to the dough hook and add the remaining 1 3/4 cups flour and let the dough hook knead the mixture on low speed for 5 to 7 minutes. The dough should be soft and moist, but not overly sticky. In a heavy-bottomed medium saucepan, bring the sugar, water and corn syrup to a boil over high heat. Cook until the sugar is dissolved. Continue cooking, without stirring, until it turns golden, about 8 minutes. Remove from the heat and whisk in the cream. It will boil up like crazy. Let cool for 1 minute, then stir in the bourbon. Bring the mixture to a boil over moderate heat and cook, stirring, for 1 minute. 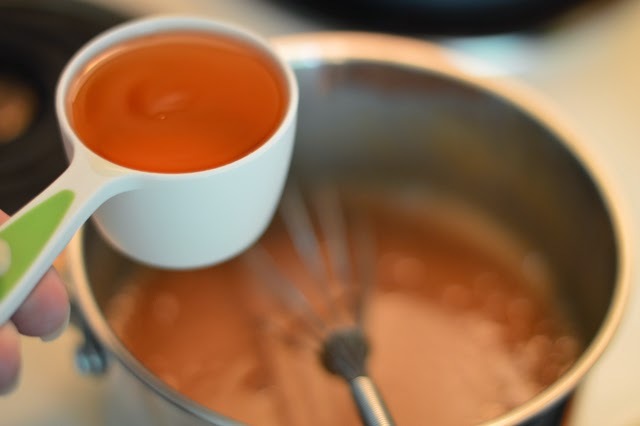 Let the caramel sauce cool. In a small bowl, combine the brown sugar, cinnamon and pecans, reserving 4 tablespoons pecans. Butter two 9-inch cake pans and line with parchment paper, then butter the paper as well. 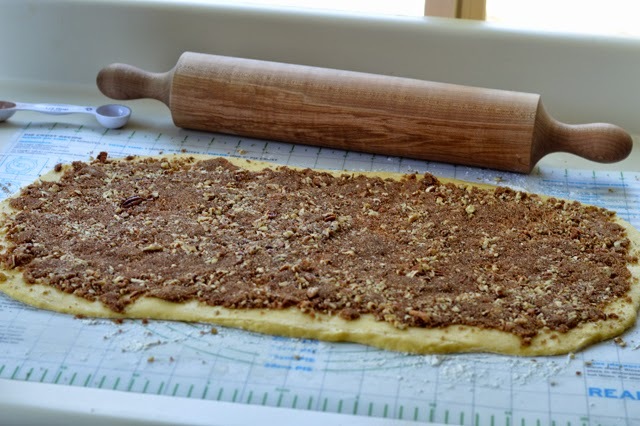 Turn the risen dough out onto a floured work surface and roll it into a rectangle that is 18 inches wide (the side nearest to you) and 12 or so inches long. Spread the dough with the softened butter using a knife or spatula. Sprinkle it with the brown sugar mixture. Roll the dough into a tight, 18-inch long spiral. Using a sharp serrated knife, very, very gently saw the log into 1 1/2 inch sections; you should get 12. Don’t press down with the knife or you’ll squish the spirals. 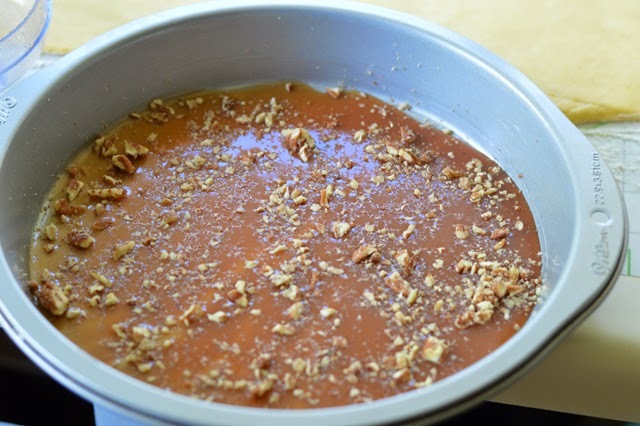 Pour 1/2 cup of caramel in each cake pan and scatter with 2 of the reserved tablespoons of pecans in each pan. This is my rule with making stuff that has nuts in it: for allergy purposes, when I can, I always put some on top so people know what they’re getting. Arrange the buns in your cake pans. Cover with plastic wrap and let rise for 2 hours on the counter or refrigerate overnight (up to 16 hours). To bake the buns, if they’ve been refrigerated, take your buns out of the fridge 30 minutes before you’d like to bake them, to allow them to warm up slightly. Heat your oven to 350 degrees. Bake your buns until they’re puffed and golden (the internal temperature should read 190 degrees), 20-25 minutes. Transfer pan to a cooling rack and let cool 5 minutes. Invert the pans onto the cooling rack. If any of the caramel gets trapped in bunless corners, just scrape it up while it’s warm and spread it back on the inverted buns. Allow to cool for 5 more minutes. Serve warm. These can be refrigerated overnight for baking in the morning after the first rise.